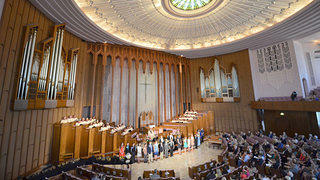 Who Really Designed Boston Avenue United Methodist Church? In one corner, Adah Robinson, a high school art teacher, painter, and printmaker. In the other, Bruce Goff, one of the twentieth century’s most original architects. 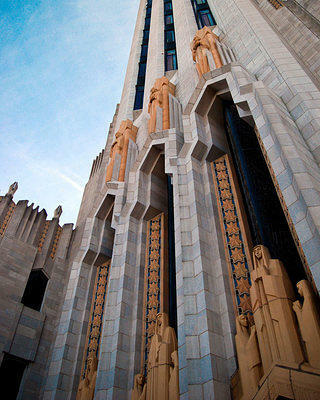 The trophy: bragging rights for designing the Boston Avenue United Methodist Church, an imposing and gloriously Art Deco edifice in Tulsa. The grudge match has been going on since the 1930s, and it’s a touchy subject in Tulsa. As the oil business boomed in Tulsa in the mid-1920s, the city’s skyline blossomed into an Art Deco wonderland. And the Boston Avenue United Methodist Church, which was outgrowing its third building since the congregation formed in 1893, decided it was time for a new building fitting for exciting times. So a committee formed to start the process. The chair of the committee, C.C. Cole, and his wife traveled Europe and the U.S., looking at churches for inspiration and feeling lukewarm about it all. “They were stuck at, ‘OK, here’s what churches have looked like. That’s not really what we want to do, but we’re not sure what to do,” says David Wiggs, senior pastor of the church, which stands officially and firmly on the side of Adah Robinson. A portrait of Robinson, who died in 1962, hangs in the church’s main lobby, to the eye-rolling exasperation of people on the Goff side of the debate. The Coles turned to their artsy friend Adah Robinson for help shaking their thinking loose, and Robinson presented sketches to them of her unusual vision for the church. The Coles took these to the pastor, who needed persuasion before he and then the full committee approved the ideas. But Robinson wasn’t an architect, so the project was beyond her capabilities. This nationally recognized historic landmark is known as one of the most significant examples of Art Deco architecture. However, she suggested a former student named Bruce Goff, who was about 22 years old at the time, about half his teacher’s age. A child prodigy who started as an intern with the architectural firm Rush, Endacott and Rush when he was 12 years old, Goff had designed a home and studio for Robinson in 1923. She advised securing the services of the firm so she could work again with her former student. All neat and tidy, until it went messy, as collaborations sometimes do. 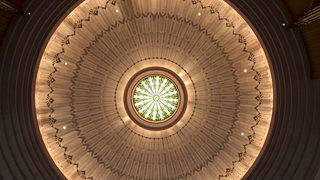 The dome at the top of the Boston Avenue sanctuary. The program went off well and I was really enjoying myself when a young lady announced from the stage, "Oklahoma should be proud of Miss Adah Robinson who designed the Boston Avenue Methodist Church." Then I saw red. I do not know which "side" of this controversy you are on, but I believe you would want to be on the right one. The story back of all this confusion as to who did design this building is long and sorrowful and this is not the place to tell it. Suffice it to say in all honesty and sincerity, A.R. did not dream, vision, conceive or design this building. It is mine. Adah Robinson also took a stand in 1945, resigning from the University of Tulsa, where she had developed the art program, when the school’s new president said he did not believe she designed the building. And today, long after the deaths of the individuals involved, the two sides still squabble. Light is highly emphasized throughout the sanctuary's architecture. “Any realist knows that, all right, what did you do before? What did you do next?” says Zachary Matthews, a Tulsan who is on the board of Friends of Kebyar, which advocates for Goff’s work. “What looks alike? Where does your style carry on? What are your influences? And there was never anything from her." Architectural sketches, no. Robinson wasn’t an architect. The church does have pastel drawings, dated 1925 and ’28, of decorative details and color pallets. And this is the argument that the church stands by. 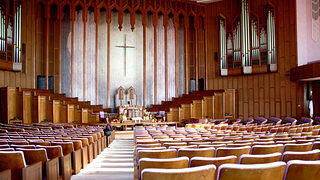 A photo of the Boston Avenue sanctuary and the congregation on a Sunday morning during worship. So what we have here is the legacy of a mature woman and teacher versus that of a confident young man whose talent she helped nurture. Is it possible she influenced him as well as supporting him? That her young student, in the flush of early success, “forgot,” as Wiggs puts it, to credit her for her contributions? Or is that notion absurd because Goff went on to a successful career as an architect while Robinson continued her career as an educator? It all depends on who you ask—or maybe, who you choose to believe. Dallas, Texas-based writer Sophia Dembling is author of "100 Places in the USA Every Woman Should Go," "The Yankee Chick’s Survival Guide to Texas," and other books. Her articles and essays have appeared in The Dallas Morning News, Wall Street Journal, Entrepreneur, Texas Journey, and many other newspapers, magazines, and websites.